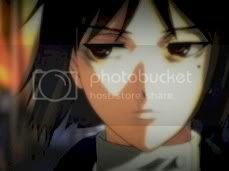 Woot, cos i wanna make it a fast post, so i'm blogging Full Metal Panic! - The Second Raid Ep7 tonight. Lazy to blog PPD cos i need to think lol, FMP - TSR's easy, cos i've typed out the summary le heh. Recap from previous ep, Sousuke was panting hard, pissed abt the email he received then he opened the window and was shouting for Wraith to show himself. When there's no response, Sousuke actually yelled out his name, title and stuff and even the reason why he was there to protect Kaname ... ha, then Wraith called him through Sousuke's cellphone and was like 'Are you mad?!' 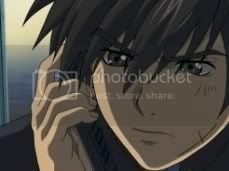 Later, Sousuke kinda blackmail Wraith to tell him about Kaname stuff la whether he's guarding her or not ... blah blah. Then Sousuke was like not really believing that Wraith guy ... cos he never did helped Kaname when she's in trouble and stuff ... then on with alot crappy stuff of Wraith guy reminding Sousuke abt the order he got in the email and stuff and demoralizing him also haha. Scene change to morning, Kaname woke up ... went to da toilet, looked at the scissor and comb she used to cut Sousuke's hair and smiled. LoL. A rainy day ... lol Kaname looks pretty happy that morning haha. Then Kyouko was like Kaname's in such a good mood today haha ... there's something strange about it. Kaname was like laughing it off lol. When they got in the classroom, Sousuke's not there yet and Kaname was like looking at the door and time ... wondering what he's doing. Scene change to Sousuke packing up his stuff in his room ... going down the lift ... stacking the boxes up in a ... truck? Yeah guess he's really leaving. Oh he wrote a letter, saying he's quiting school too and juz when he's abt to chop it, Kaname called his cellphone and Sousuke was hesitating to answer. He didn't answered it anyways. He continued packing and stuff in a badddd mood lol. 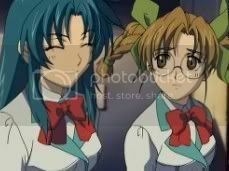 Scene change to Kaname and Kyouko walking home, and they're comparing test results haha. Kyouko was like what's Kaname's secret to getting good results haha. Subject changed to Sousuke, they're worried cos Sousuke didn't come to school and Kyouko suggested to call Sousuke ... Kaname kinda shrugged it off saying it should be alright. Then subject changed to celebrating and stuff ... while they're walking ... whoa Yanlan walked past them, kinda stared sideways at Kaname and Kaname felt the 'shivers', turned back and saw noone ... [Whoa that scene's cool] Kaname was like shaking with fear ... even Kyouko's worried about her. Kaname then called Sousuke and it was either turned off or out of range. Kaname got a little worried, then told Kyouko that she's going home. Kyouko was like she can't let Kaname go home alone and stuff, but Kaname kinda yelled it's ok and left. Kaname went back to her home, locked the doors, walked to the living room in the dark, switched on the TV, lied on the sofa and covered her head with a pillow ... later she turned up the TV's volume then switched it off. Then she kept chanting it's ok, nothing's wrong ... then she heard a sound. She got up off the sofa, held a broomstick on her hand and glanced at the door. Juz someone who had sloted some paper la. lol. 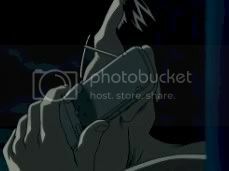 Then the phone rang, Kaname answered it ... and the other person didn't say anything ... Kaname got worried and called Sousuke but couldn't reach him. Later, she got out of her room, wanting to call for help through a transmiter. 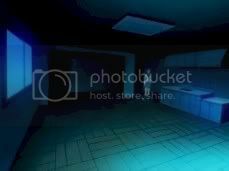 Then she ran to Sousuke's place and found ... the room empty and her notebook on the hallway of the room. 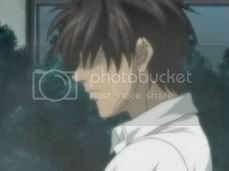 Kaname was shocked to see the place empty ... Whoa, a kinda ... 'nothing much' ep lol. Just building up the tension ... yep. Oook, i need to go watch ... let's see ... 1,2,3,4,5,6 anime ep tonight lol. Tsukuyomi Moon Phase was finally sub finished so got 3 Eps waiting for me ... and Gundam Seed Destiny Ep49 too is itching over there for me to watch ... i wanna watch Pani Poni Dash! Ep6 cos lol after watching Ep5 ... damn funny ... hahaha, i juz wanna go on laughing and laughing. Ahh, stop wasting time! Let's go! LoL. PPD Ep3 tomorrow! Cya. Oh need to download FMP - TSR Ep9 ... too bad there's only 13 Eps for FMP - TSR ... why why why!!! Sigh. Cya. PS: ... Life is peaceful ... for now.